The Red Keep dominates the skyline of the city of Kings Landing. Located at the southeastern corner of the city, it overlooks Blackwater Bay and the Narrow Sea. It serves as the city's primary fortress and redoubt and is the Seat of the Iron Throne. Capturing the majesty of The Red Keep, Factory Entertainment's artists were able to sculpt this collectible in a mixture of high and low relief, which are commonly used in historical art pieces. Constructed during the rule of Maegor Targaryen it is filled with secret passageways, true to his nickname, Maegor the Cruel had the builders of the Red Keep executed once construction was completed to help protect those secrets. Each piece is cast in heavyweight polyresin and is finished in a bronze effect and patina. 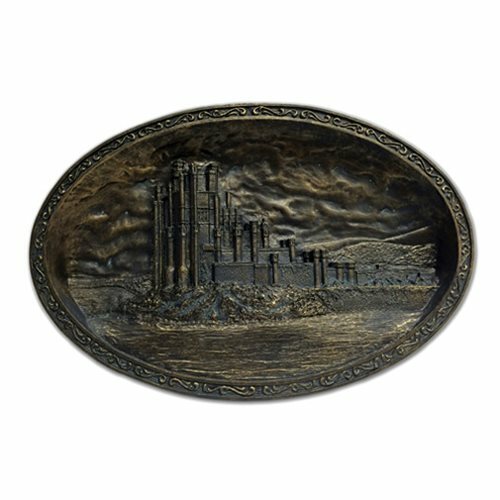 The Red Keep Relief Sculpture has a choice of display options on the rear and can be either wall mounted or displayed on a desktop. To create this iconic piece, HBO provided Factory Entertainment's designers with access to the original visual effects files used to create various props and sets from the series. In addition, scenes from the show were carefully scrutinized for fine details and nuances. A master pattern was then meticulously hand-sculpted to create a truly immersive experience. Each piece is individually numbered and includes a certificate of authenticity. Measures 12-inches wide x 8-inches tall, with a 1-inch thickness.